After being held for five months without charge under the supervision of the Terrorist Investigation Division (TID), senior Tamil journalist J.S. Tissainayagam has been formally indicted by the High Court of Sri Lanka under the Prevention of Terrorism Act (PTA) (1979). The indictment reportedly refers to the printing, publishing and distribution of the North Eastern Monthly between June 1, 2006, and June 1, 2007; alleged offences to do with bringing the Government into disrepute; and the violation of 2006 Emergency Regulations with regard to allegations of aiding and abetting terrorist organisations through raising money for the magazine. In the almost 30 years since the PTA was adopted as a “temporary” measure, no individual journalist or media entity has been charged under the PTA. 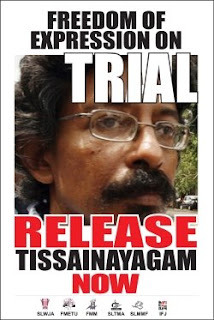 Tissainayagam was arrested on March 7, 2008, after checking with police on the welfare of N. Jesiharan, the owner of E-Kwality Printing Press, and Jesiharan’s partner, Valamarthi, who were arrested previously and are also reportedly under indictment. It took five months for Tissainayagam to be formally charged. Now he has finally been formally indicted he is at great risk of going to jail for doing his job. The IFJ and its local affilates are demanding his immediate release and complete unconditional withdrawal of all charges.